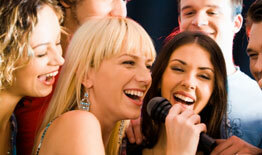 If you are looking for a DJ for your birthday party, you have come to the right place. A2B DJs provide top quality DJs for 16ths, 18ths, 21sts, 30ths, 40ths, 50ths and everything in between. We are one of Corks biggest DJ Company’s and have the best party DJs. We know exactly what songs to play and when to play them. We also welcome play lists so you can choose the songs we play. Just send an email to info@a2bdjs.com or fill out our contact form here to find out more details. If you're planning a party this year, why not create a photo slideshow or video montage and display it on the night of your party. Showcase your funniest, sweetest and most memorable moments. Family and friends will laugh get teary-eyed and "aww" together as everyone shares this trip down memory lane. We rent out affordable projectors and screens for weddings, birthdays, anniversaries and corporate events.